Sugarcane or Sugar Cane is the ninth most valuable crop and livestock product by value. It is popularly grown as a cash crop for the production of sugar, ethanol and other industrial uses. Besides, Sugarcane has also been used medicinally. 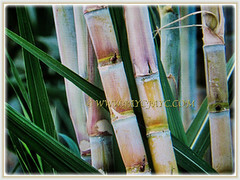 Common Names: Sugarcane, Sugar Cane, Tebu in Malay. 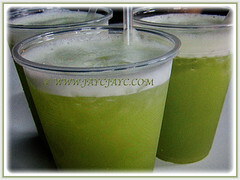 Etymology: The genus name Saccharum comes from the Greek word saccharin meaning the sweet juice of sugarcane. The specific epithet officinarum of dispensaries implies, it’s used in traditional medicine both internally and externally. Origin: Native to tropical Southeast Asia and Polynesia. It is popularly cultivated in tropical and subtropical countries worldwide. 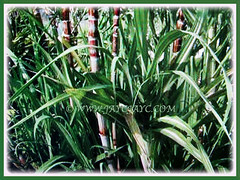 Plant type: A tropical and perennial grass that produces sweet sugarcanes. Features: Saccharum officinaruma is from the genus Saccharum that comprises of 37 accepted species. It is a tropical perennial grass that forms lateral shoots at the base to produce multiple stems, usually 1.5-2.4 m tall and spread as wide. Large stems are jointed-like bamboo about 5 cm in diameter. A network of rhizomes forms under the soil which sends up secondary shoots near the parent plant. The colourful stems or culms vary in colour, from green, yellow, orange, purple or maroon and are jointed, nodes being present at the bases of the leaves. 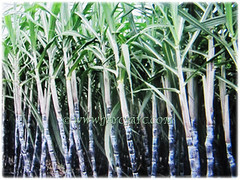 Its stems grow into cane stalk which when mature constitutes around 75% of the entire plant. The internodes contain a fibrous white pith immersed in sugary sap. Its large arching, linear and rich green leaves, measuring 70-150 cm long and up to 6 cm wide are borne alternately on the stem, with leaf base encircling the stem. They have thick midribs and saw-toothed edges. 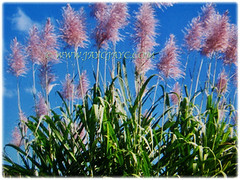 The terminal inflorescence is a panicle up to 60 cm long and a pinkish plume that is broadest at the base and tapering towards the top. The spikelets are borne on side branches and are about 3 mm long and are hidden in tufts of long, silky hair. The fruit is a small, dry and oblong caryopsis with a single 1.5 mm long seed. 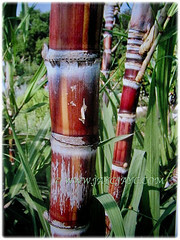 Culture (Care): Saccharum officinaruma or Sugar Cane can be grown easily with least maintenance. Moisture: Medium water requirement. It enjoys a humid environment. Soil: Fertile, moist and well-drained soils. Others: Wear gloves when handling this beauty as the leaves are stiff with sharp and serrated margins. Harvest the sugar canes before the plants flower as the flowering process causes a reduction in sugar content..
Generally free from serious pests and diseases. Nevertheless, watch out for insect pests that include soil-inhabiting wireworms and grubs, moth caterpillars, borers, mealybugs, red spider mites, termites, spittlebugs, beetles and aphids. Also, watch out for rodents and rabbits. 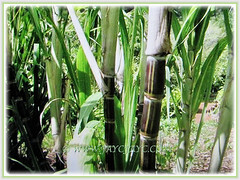 Saccharum officinaruma or Sugarcane does best in the tropics where the weather is humid and warm. It is intolerant of frost. Surprisingly, it does well in containers, so with a greenhouse, you can grow Sugar Cane in zone 5. When looking at cane to purchase and plant, choose the cane with the most nodes or rings. It is from the nodes that the Sugarcane sprouts. 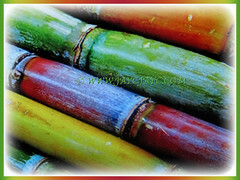 Propagation: Easily propagated by division or from Sugarcane stem cuttings. Cut each stem into 60 cm sections with about 5-6 buds to ensure success. Lay the stem horizontally into the soil in a warm location and with regular watering a few new stems will emerge. Usage: Saccharum officinaruma or Sugar Cane is grown as a cash crop for the production of sugar, ethanol and other industrial uses in tropical and subtropical regions around the world. Great to juice the stems for a refreshing sweet drink on a hot day. About 3/4 of sugarcane grown and processed into sugar is used to make bread, canned fruits and vegetables, beverages, cakes, candies, cereal, ice cream and other favorite foods. Commercial production of sugar, molasses and biofuels (ethanol and biodiesel). Its stems and the byproducts of the sugar industry are used as livestock fodder. 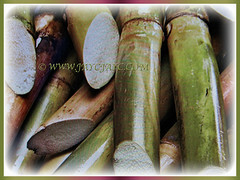 Sugarcane has also been used medicinally. In southern Asia it has been used to treat a wide variety of health complaints from constipation to coughs and has been used externally to treat skin problems. Both the roots and stems are used in Ayurvedic medicine to treat skin and urinary tract infections as well as for bronchitis, heart conditions, loss of milk production, cough, anaemia, and constipation. Sugar paste has been widely used to pack wounds and aid healing.